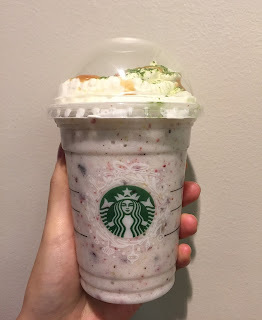 This morning, I saw that Starbucks debuted Fruitcake Frappuccino today, Thursday the 15th and it's only available till the 18th in the states and Canada. I walked to the closest store (though, it's not a good location) and showed the photo and name on the HP, but they said, "I don't know this drink" and then gave me, "What are you talking about?" look. So I walked to another one and showed the same page to the cashier, and she said they had it. To this point, it's good, but it's just the beginning of the long wait; 20 minutes of standing and constantly asked to show them the HP. I placed my order at 11:52 AM, as you can see. The cashier knew the recipe, but the barista didn't. The barista said they have the recipe in the office but if I could show her the HP she could make it. --- I have no idea why she could, because the HP only tells the ingredients but not exactly how many pushed of syrup, etc. Every 2-3 minutes she asked me to show her my phone over the counter, it never ended, just kept going, and after 10 minutes, she was looking for matcha powder while sprinkling cinnamon on top although it's NOT used on top, but IN the Frappuccino. And here it comes again, the cashier asked me to show her my phone. --- Why didn't they just grab the OFFICIAL recipe from the office and TAK A LOOK to make it? 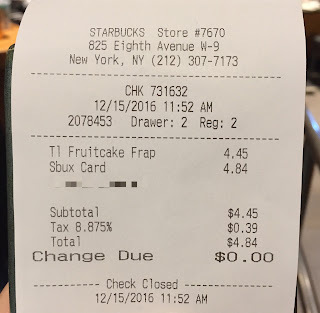 13 minutes later, I FINALLY got the Fruitcake Frappuccino, jeez. 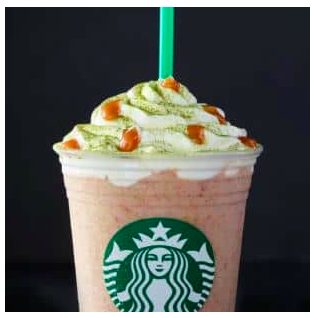 It's a Hazelnut Frappuccino base with dried fruit, cinnamon, milk and ice, topped with with whipped cream, caramel dots and a matcha sprinkle. "Caramel dots" was more like caramel drizzles. Under the sunlight, it looked much whiter. I knew it'd contain cinnamon but didn't expect it'd be that strong. And I didn't grow up with Fruitcake (uses dried fruits, nuts and spices and dense cake), it's too unique for me. Every sip had popping little dried fruits pieces coming through the straw was nice, but still the flavor wasn't something I was hoping for. Besides, matcha powder was an incomprehensible ingredient since it's not commonly used for fruitcake, I assume. And the bitterness and sweetness from the caramel didn't help the traditional festive cake flavor, and I could only sip like one fifth of the cup. Today, I just wasted time and money on this. I get good experience once in a while at Starbucks but in NYC, mostly it's not that excellent. There're so many stores in the states and the world, and if each can't create the products following the official recipe or even doesn't know the newest product on the day they're supposed to launch, I wonder how Starbucks is controlling all the locations to offer good service. If they can't do the job, they'd better shut down some locations and focus on less stores that they can surely watch over.